Chef Guapo's Delectable Food Sharing our amazing meals with the internets. The great thing about almost any cut of steak is how little it takes to make it good: a little salt, some pepper, and a good sear. Searing a steak on a hot frying pan can be just as enjoyable and delicious as cooking a steak on the grill (get yourself a good frying pan that retains its heat well, like a stainless steel-wrapped aluminum pan or if you can afford one, a copper fry pan). Guys, if you want to impress the ladies, you have to show them that your skills extend beyond the grill. This recipe uses a thinly cut New York Strip; it’s cheap, delicious, and cooks quickly. Any cut is fine, and a sirloin would do just as well. Be sure to prep your meat at least 5 minutes before you plan to cook it–bringing your meat up to room temperature is important for even cooking. Generously apply salt and pepper to one side and let sit. In the meantime, melt a tablespoon of butter over low heat and throw in a sprig of thyme or 2 bay leaves (a bay leaf is pictured, but I prefer thyme). Once your butter is melted, turn your heat up to medium-high/high depending on your stove. Don’t throw the meat in the pan right away; give it a minute to heat u, then place the seasoned side down and let it sear. Don’t move the meat–allow it to get a good sear for 2-3 minutes. Season the other side while in the pan. After 2-3 minutes, flip the steak over and allow it to cook for another 2-3 minutes (depending on the thickness, cooking times will vary–for this cut of meat, 2-3 minutes on each side will give you a medium-rare finish). Take the meat off the heat and transfer to a plate and cover with foil. Let the meat rest for 5-10 minutes before cutting into it. 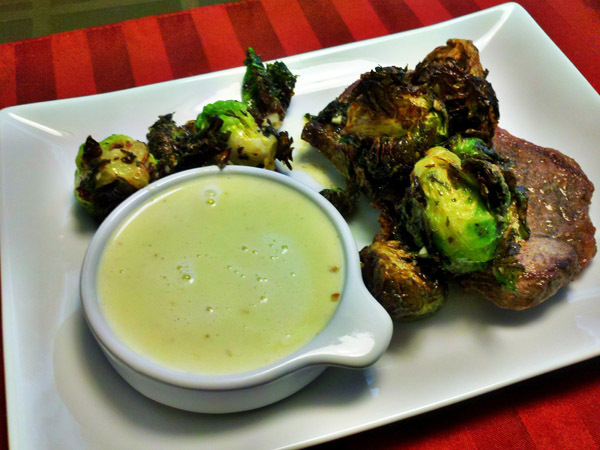 Lauren loves brussel sprouts–sauteed in a lemon cream sauce, slowly steamed in a shallow pool of rich chicken stock, or simply pan-fried with salt and butter–so I try to take this little cabbage and push the limits with it. Everything is better deep fried right? This recipe is so simple you don’t even need a fry batter. This recipe is tailored for about 12-15 large brussel sprouts, so you may need to adjust the amount of vinaigrette depending on the number and size of the brussel sprouts you’re using. We use a deep fryer, but you can fry these in a deep frying pan over the stove as well. Vegetable oil works great, but if you want to really go crazy, deep fry these little guys in duck fat or lard (it will go straight to your gut, but you can feel good about it because brussel sprouts are healthy for you too–they cancel each other out right?). Heat your oil to 350F. Cut each sprout in half if you’re working with large sprouts, which I prefer, but if your grocer only has the little sprouts, ignore cutting them at all and toss them right in to the oil raw. Yes, raw. No batter. No seasoning. Raw. Working in small batches, 4-5 per rotation. Let them fry for about 3 minutes and then pull them out with a slotted spoon and set them on a few paper towels to absorb any excess oil that drips off. Whisk all the ingredients except the olive oil in a large mixing bowl. Add 1 tablespoon of olive oil and whisk, repeat with each tablespoon of olive oil. Set aside. When all the brussel sprouts have been fried, pour them into the large mixing bowl with the vinaigrette and stir to coat every single sprout. Don’t worry if some of the leaves on the brussel sprouts fall off. It’s nice to have a few loose leaves to use for plating. I love cooking with heavy cream, because you can infuse all kinds of flavors into it. This sauce is slightly salty and sharp with a mild bite thanks to the jalapeno. In a medium sized pot, melt the butter over medium-low heat. Once the butter is melted, add the garlic and jalapeno (if you want a spicier dipping sauce, feel free to leave the ribs in or add some or all of the jalapeno seeds). Saute for 20 seconds and then add the heavy cream. Bring the cream to medium heat (do not let it boil, this will ruin the cream and your sauce). Reduce to low heat, add the cheese and whisk until smooth and creamy. The sauce should be slightly thick, but not clumpy–it should easily coat the back of a spoon. Pour a quarter cup of cream sauce into individual bowls and set aside. Place the meat on the center of the plate and stack 3-4 brussel sprouts on top of the meat. Place 2-3 additional sprouts around the plate (this is a good time to use those additional leaves that fell off when you tossed the sprouts with the vinaigrette). Place the individual dipping bowls on the edge of the plate and serve. 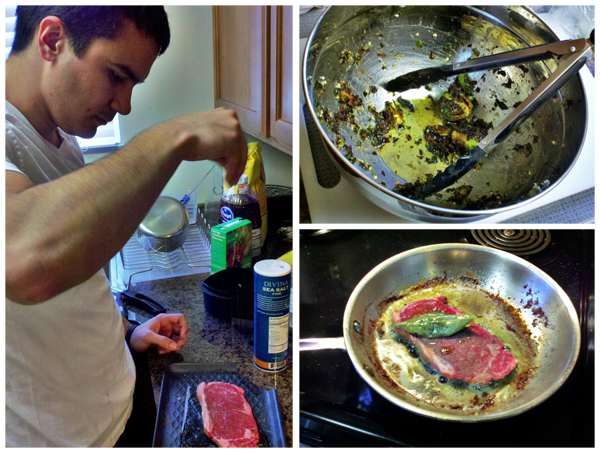 The sauce compliments the steak quite well, but you can toss a brussel sprout in there as well if you’d like. I didn’t know Lauren was going to take a picture of the final product. You would think I would have learned by now that she almost always pulls out that smart phone of hers come dinner time, but alas. The plating isn’t spectacular in the picture, but we ate it all the same.